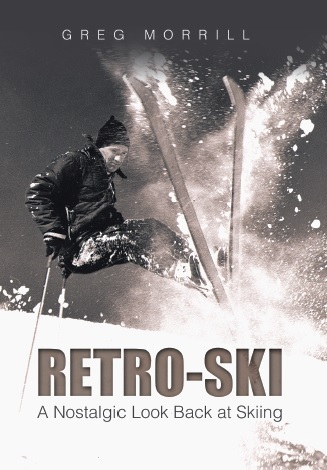 After World War II, skiing’s popularity in Vermont really began to grow and it brought out the entrepreneurial spirit in Vermonters. Kermit and Anabel Moriarty lived on the Mountain Road in Stowe with their two sons Marvin and Darwin in the house now occupied by All Seasons rentals. The Moriartys began to take in boarders during the ski season for $16 a week, $24 with food. They attracted a lot of serious skiers including ski patrol and ski instructors. Anabel had always knit hats for her family and soon the boarders were requesting that she knit hats for them as well. That could have been the end of the story, but Anabel’s son Marvin was an exceptional ski racer. He was named to the 1956 U.S. Olympic team at age 17, making him the youngest man ever to be selected. Of course when he went to Cortina to compete, his hat went with him. 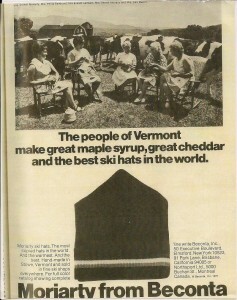 Suddenly a local Stowe fashion gained an international market and the Moriarty Hat and Sweater Company was born! It took Anabel three hours to knit one hat by hand so the challenge was to meet the increased demand for hats. Anabel parsed the work out to other home knitters, knitting machines were purchased, and a shop was built next to the Moriarty home. (That shop now houses Creative Consignments.) Eventually they were able to produce a hat in less than 20 minutes. In 1962 Moriarty sold 3000 hats; in 1964 8000 hats; and in 1965 an estimated 40,000 hats! By 1975 Anabel was using more than 50 home knitters. The hat was extremely durable and with proper care would probably last forever. Jean Claude Killy ordered one during the 1960s and rumors exist that he still has it! The double-knit headband made for a snug fit that lasted. 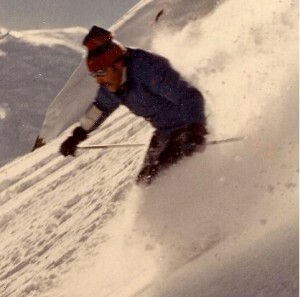 I owned a non-Moriarty hat that became so loose that it would come off when you skied fast or hit a mogul. Moriarty hats were tight and stayed in place. The hat indicated a serious skier. The story goes that a man was browsing in the shop and Anabel asked if he was interested in a hat. “Oh, no, I’m not a good enough skier” was the man’s answer. The Moriarty Hat and Sweater Company stayed in the control of the Moriarty family until 1985 when the business was sold to Ed Morrison. One of the additions to the original hat that Morrison made was a turtle fur liner on the headband which was lot easier on the forehead and ears than the old scratchy wool. In 1993 Morrison negotiated a deal for the company to be the official licensee to distribute ski hats and sweaters with the Grateful Dead dancing bears and skeletons. Tom Hubbs correctly answered last week’s trivia question that Moriartys was the Stowe link between Jean Claude Killy and the Grateful Dead! Ed Morrison died in 2008 and the Moriarty business has not been active since. The Vermont Ski and Snowboard Museum has access to Morrison’s left over inventory and may now be the only place you can purchase a new Moriarty hat. What better gift for the RetroSkier on your Christmas list than a new Moriarty hat! You can check them out at the museum shop or online at http://www.vtssm.com/store. They even have some with the Grateful Dead dancing skeletons! I have lost the instructions on knitting the Moriarty hats,do you know where I can get them?